Landing carp safely is all about patience and care. Anglers who chase fish with the net may knock them off the hook. 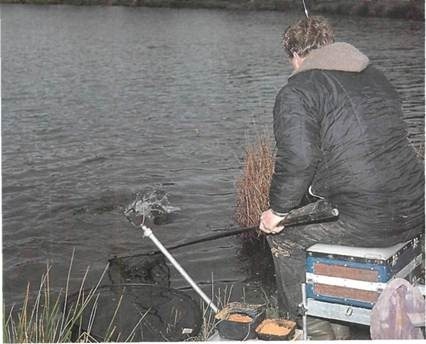 So it’s essential to wait until the fish’s head is above the water before attempting to net it. 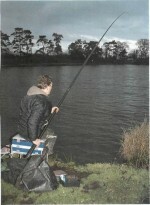 Mick draws the carp over the net and lifts it clear. It’s a plump mirror of about 1 ½ lb (0.7kg). “I’m just going to have a little look in on the weed with the lighter tackle. If I get a response then I’ll go in on the heavy gear,” Mick says, dropping the feeder about 4m 4i4yd) beyond his original cast. Sure enough, a minute or two later the tip – which has been sitting 2.5cm (lin) or so iear of the water – rises steadily and Mick strikes. “It’s not very big,” he says, steering t through the weed. In fact it’s a crucian of about 6oz (170g) – not massive but encour-iging, nevertheless. If the lily pads are close to the bank then the bites are often more tentative – perhaps no more than a little twitch of the tip and they’re on. 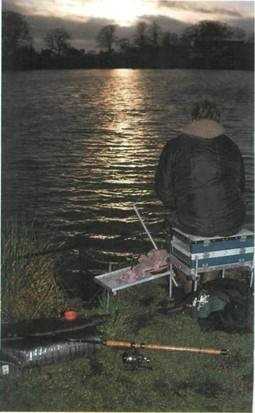 The implication is that although big baits ;an be fished on heavier gear, you may have TO wait longer for bites or may simply not et any at all. But the match angler is always fishing for bites. Maggots tend to yield more bites – but only on lighter tackle. ‘There’s always a line,” says Mick. 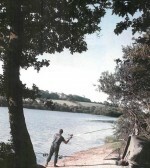 ‘Matchmen tend to work up to it rather than down to it.” “That was a ripping bite,” says Mick, as the rod bends under the strain of a good fish. It was too. The tip just rose and kept going. 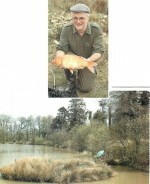 Following up with another crucian, Mick is experiencing another lean spell. He winds in the feeder to find a little roach on the hook. That could have been the problem. Still, he’s tempted to try the pole again. So out it goes, followed by a good pouchful of pinkies. A minute later the inevitable happens. The pole goes up, a couple of metres of elastic appear and the pole bends alarmingly. ‘This feels big,” Mick grimaces, as he hangs on to the inadequate tackle. The dead weight yields a little. “It’s not big,” he says, steering it to one side for the benefit of our photographer. The unseen force ploughs off steadily in the direction of Audley. “Yes it is.” The line breaks. “We’ll bin that,” says Mick, dropping the rabbled rig into his box. The Cheshire skies are so full of rain that it’s almost dark. Mick has taken another mirror (slightly smaller than the first), another crucian and has just pulled out of another fish in the weed. He’s given up on the pole line and is concentrating all his efforts on the heavy rig in the weed. “It’s funny, I came here on Wednesday [two days ago] and I couldn’t get a bite on the heavier line,” he says. Double red maggot seems to be doing the trick (though Mick stresses that it is not as decisive as casting into the weed). A bigger bait is less likely to attract the attentions oi small fish. ‘You don’t want to sit here an hour at a time with single maggot on the hook and end up with a crucian. You warn the bigger fish.” Hooking one maggot in the usual way and the other through the pointed end helps to prevent the bait spinning and the hooklength twisting. Somewhere out there among the rotting lily stalks, a carp finds the two red maggots The line tightens, pulling the tip up. Mick strikes and the rod bends. Several times the rod stops moving as the fish buries itself ir debris but each time a little extra pressure is enough to free it. After plunging about under the rod, it’s finally brought under control and netted. “That’s as good a fish at you can expect in the weeds,” says s delighted Mick, admiring a plump little pig of a mirror carp of around 4lb (1. 8kg) – a fitting end to the session.